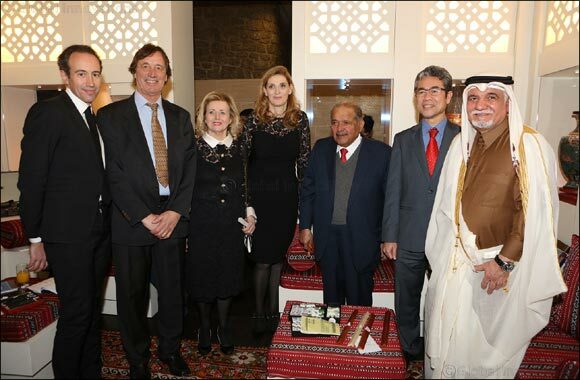 Doha, Qatar, December 01, 2018: Following its highly successful showcase at the Grandmaster’s Palace in Valletta, The Majlis – Cultures in Dialogue, a travelling cross-cultural exhibition that features a collection of the Sheikh Faisal bin Qassim Al-Thani Museum – a unique assembly of artefacts reflecting the interaction of civilizations in the past while encouraging dialogue in the present – opened up to a great start, hosting more than 200 VIP guests on the 29th of November at the UNESCO Headquarters in Paris, taking the audience's delight to a new height with a specially composed song 'Cultures In Dialogue', by the legendary female Qatari composer Dana Al Fardan. The official world premiere of this song was performed by numerous musicians from Qatar. The exhibition was highly appreciated by the personages as well as international media, who have attended the first day of the opening ceremony. It was successful in distinctly establishing rich Qatari culture on the global canvas through impressive artefacts. This event also emphasized on the crucial importance that museums play in showcasing the cultural prowess in initiating dialogue. Mr. Kees Wieringa, Director of the Sheikh Faisal Bin Qassim Al-Thani Museum, in the presence of Sheikh Faisal Bin Qassim Al Thani and Mr. Xing Qu, the Deputy Director General of UNESCO for Culture, welcomed a number of journalists from highly esteemed French and international media for engaging guided tours during the day. H.E. Sheikh Faisal Bin Qassim Al Thani and Mr. Xing Qu addressed government, cultural and corporate officials from Qatar and France, representatives of a number of cultural institutions, as well as Mr. Andrew Faulkner, Chairman and Managing Director of Qatar Shell, with warm welcoming words, as they celebrated the opening of the exhibition at UNESCO Headquarters in Paris. The Majlis – Cultures in Dialogue has been organized at the initiative of the Sheikh Faisal Bin Qassim Al-Thani Museum, in collaboration with the UNESCO Doha Office, the Qatar National Commission for Education, Culture and Science, and Qatar Museums. Under the Platinum sponsorship of Qatar Shell, the Silver sponsorship of Refalo & Zammit Pace Advocates and local sponsorships of QNB and Katara Hospitality, the exhibition will stop in the UNESCO Headquarters for a duration of two weeks before moving forward to the Institut du Monde Arabe in Paris, for a 2-month period. This diverse cultural exhibition recreates the atmosphere of the majlis—the space of hospitality and dialogue present in homes throughout the Arabian Gulf—offering guests the opportunity to exchange ideas about how much common ground exists between different cultures, and how these commonalities have been expressed in technology, art and culture. “We are overwhelmed to receive such a stupendous response for “Majlis – Cultures in Dialogue” event in Paris. The city is known to be a connoisseur of global art & culture and the success of this event very well resonates with its inherent philosophy of spreading peace by way of artefacts, handicrafts, arts and songs. “I am honored to contribute a piece of music dedicated to bridging cultures and promoting dialogue. Music is a universal language that transcends physical and cultural barriers, creating shared values and experiences that enrich the human spirit and condition. I am proud and honored to participate in this noble cause to unite humanity through the arts. This piece was composed to highlight historical commonalities between civilizations around the world. The musical features of this composition resonate between Eastern as well as Western cultural movements and traditions, with the intention of bridging the gap, and invoking a heritage based on inclusion”. The Majlis – Cultures in Dialogue is a visitor’s experience that reveals how global perspectives can vary depending on the position of the viewer. Following Paris, the exhibition will visit several countries, including Austria, Germany, Spain, Turkey, and the UK. The tour will also include the United States by 2021.